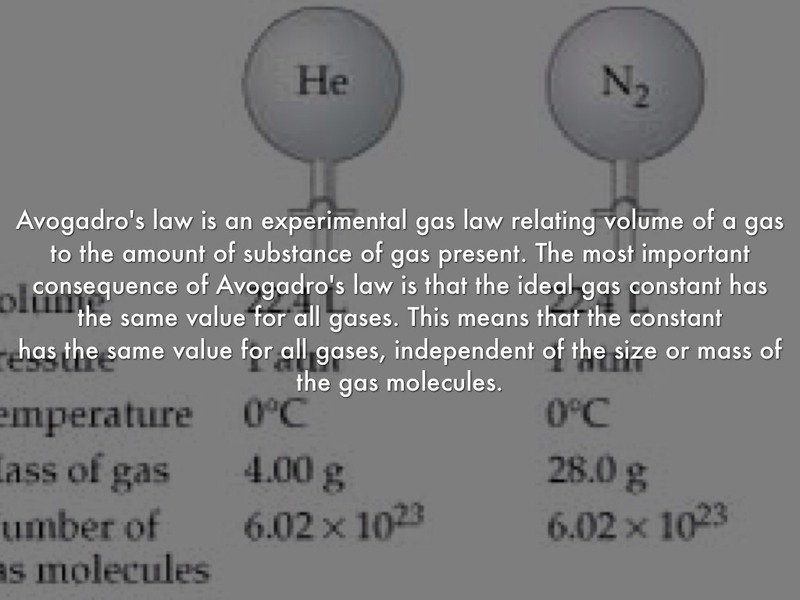 has the same value for all gases, independent of the size or mass of the gas molecules. 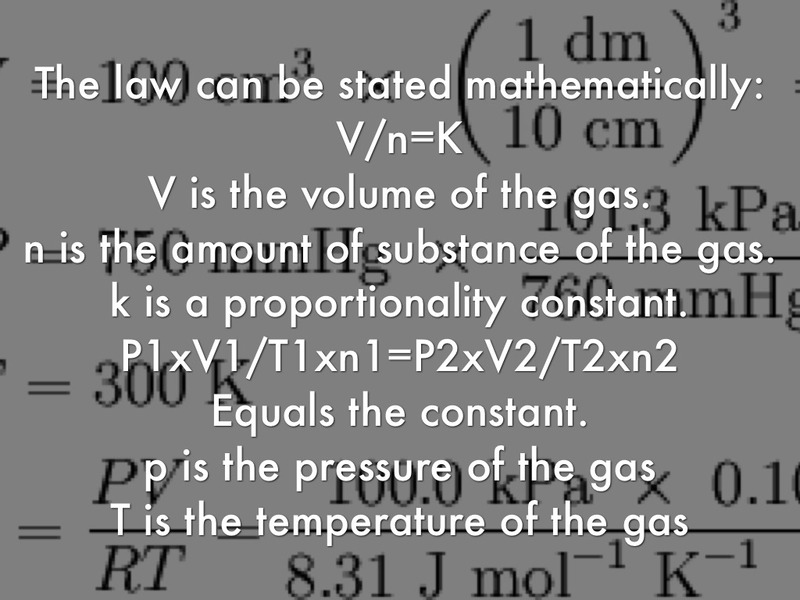 V is the volume of the gas. n is the amount of substance of the gas. k is a proportionality constant. 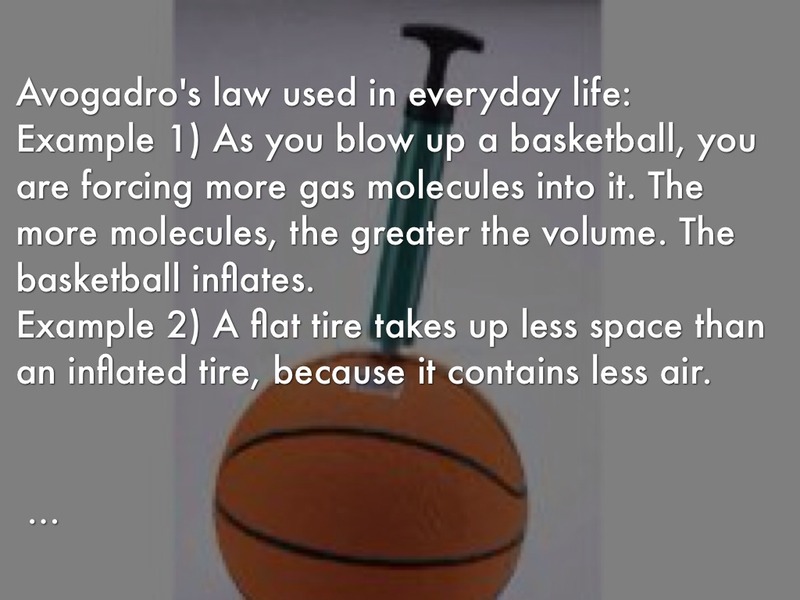 Example 1) As you blow up a basketball, you are forcing more gas molecules into it. The more molecules, the greater the volume. The basketball inflates. Example 2) A flat tire takes up less space than an inflated tire, because it contains less air. Example 3) Lungs expand as they fill with air. Exhaling decreases the volume of the lungs. 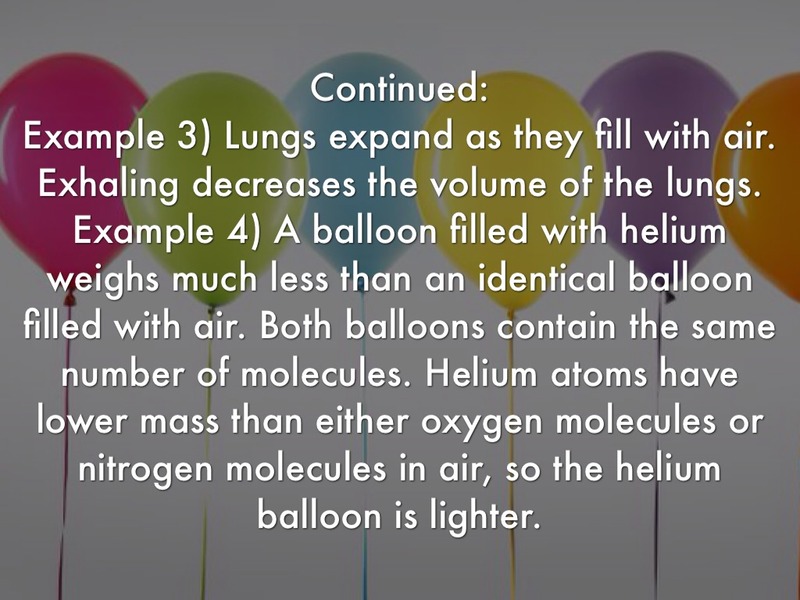 Example 4) A balloon filled with helium weighs much less than an identical balloon filled with air. Both balloons contain the same number of molecules. Helium atoms have lower mass than either oxygen molecules or nitrogen molecules in air, so the helium balloon is lighter. 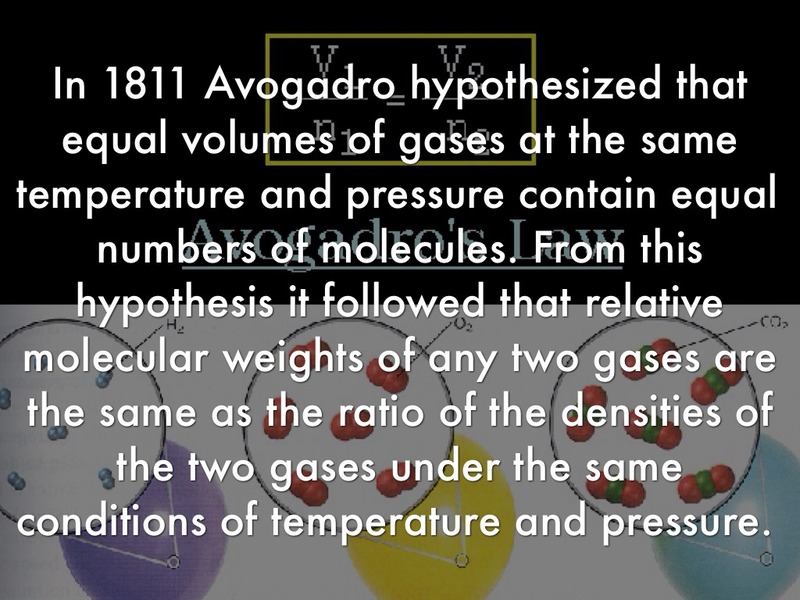 In 1811 Avogadro hypothesized that equal volumes of gases at the same temperature and pressure contain equal numbers of molecules. From this hypothesis it followed that relative molecular weights of any two gases are the same as the ratio of the densities of the two gases under the same conditions of temperature and pressure. 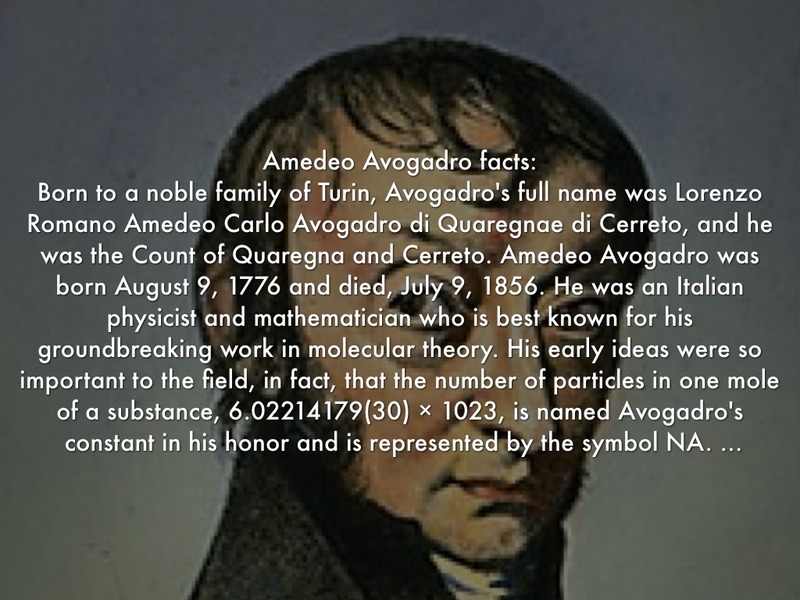 Born to a noble family of Turin, Avogadro's full name was Lorenzo Romano Amedeo Carlo Avogadro di Quaregnae di Cerreto, and he was the Count of Quaregna and Cerreto. 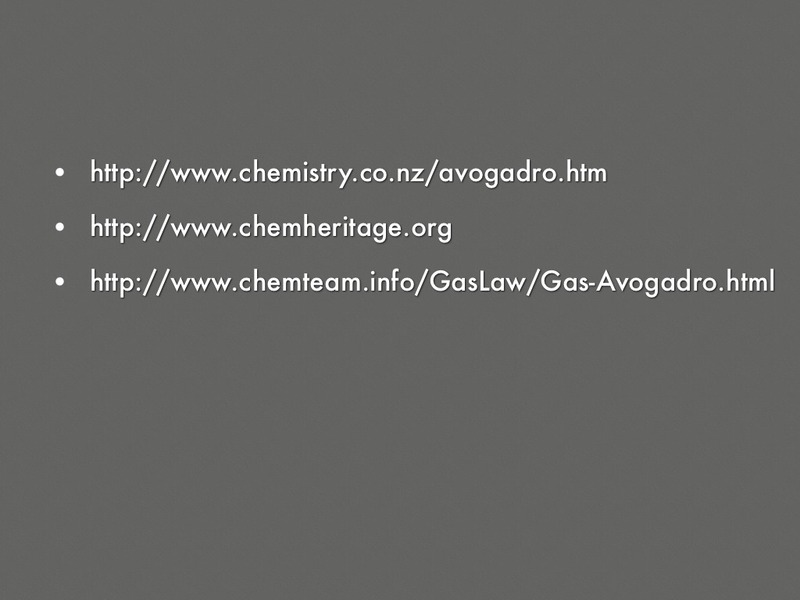 Amedeo Avogadro was born August 9, 1776 and died, July 9, 1856. He was an Italian physicist and mathematician who is best known for his groundbreaking work in molecular theory. His early ideas were so important to the field, in fact, that the number of particles in one mole of a substance, 6.02214179(30) × 1023, is named Avogadro's constant in his honor and is represented by the symbol NA. 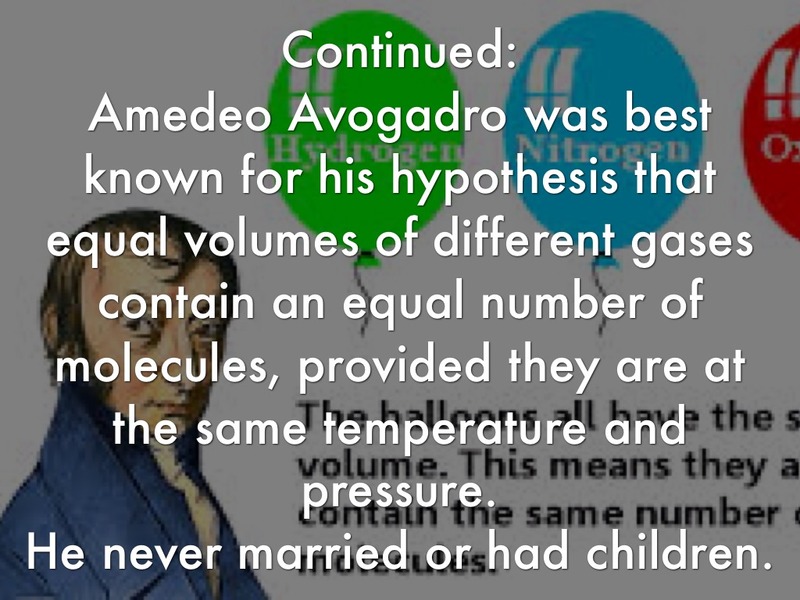 Amedeo Avogadro was best known for his hypothesis that equal volumes of different gases contain an equal number of molecules, provided they are at the same temperature and pressure. He never married or had children. 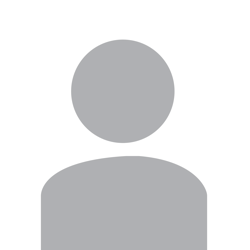 5.00 L of a gas is known to contain 0.965 mol. 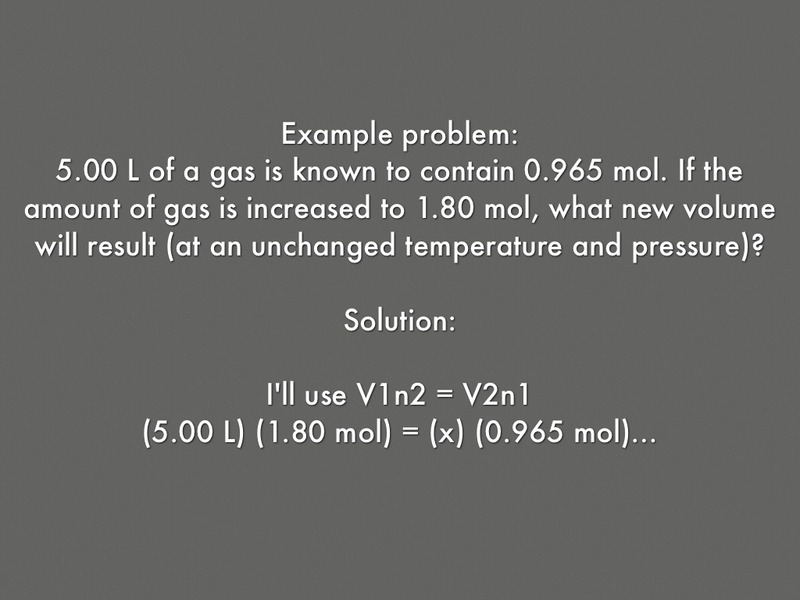 If the amount of gas is increased to 1.80 mol, what new volume will result (at an unchanged temperature and pressure)?